What is Polish cuisine? While it is always tough to define or pigeonhole any country or locale’s food, Polish cuisine is not vastly deviant from that of other eastern European nations or groups. Traditional foods are well suited for its bone-chilling winters. Sausage, pork, potatoes, cabbage, beets, and sour cream are a few of its staples. Not unlike what I experienced in the Baltics, Polish food bears the influence of Germanic and Russian or Slavic ethnicities, while ‘modern’ Polish cuisine is more delicate, embracing fusion with the flavors and techniques of its fellow European Union comrades. Yet calling it heavy, or simple, or hearty misses the pride, history and indomitable spirit of the Polish people. I was fortunate to sample both the old and new in Poland, along with Italian and other international haunts in Poland. In my next few posts, I’ll highlight a few amazing restaurant experiences; a touch of romanticized Old Poland in an amazing restaurant; New Poland and organic fusion; and a cafe specializing in chocolate and desserts – a small Polish chain that I would have expected in Germany before Poland. Consider me delighted. Pierogis to end all pierogis! 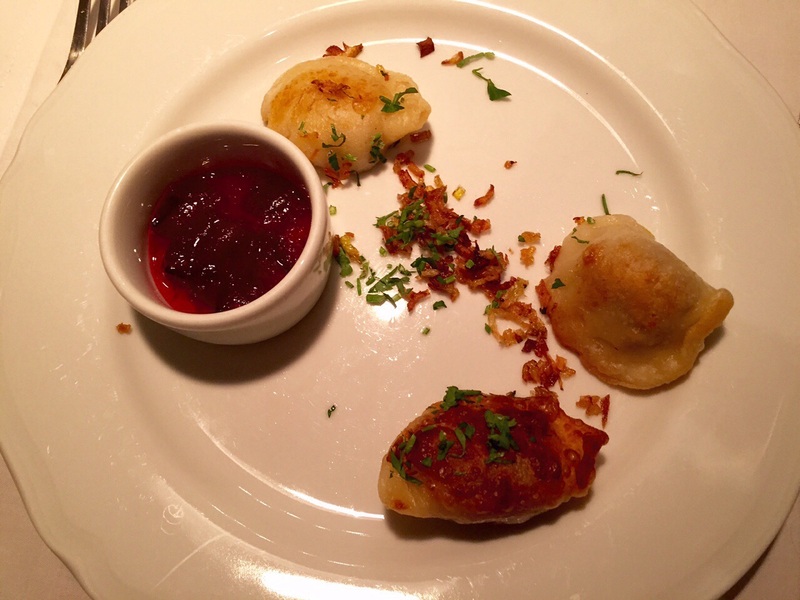 I couldn’t visit Poland – or begin to discuss Polish food – without pierogies. In college, I often made meals out of microwaved, frozen cheese-filled pierogies (potato dumplings for the un-indoctrinated). In Poland, I was witness to more varieties of pierogi than I thought possible. With such choices, we narrowed ours down to spinach-filled and a more traditional, Russian-style potato-filled pierogi topped with caramelized onions at a casual eatery. TThey were good, but they paled in comparison to the perfect, pan-seared dumplings served at Pod Aniolami (a future post) a few days later. Those gourmet pierogies would be welcome to just show up in my kitchen anytime. Such close proximity to Russia leaves little surprise that Poland takes great pride in its vodkas and vodka infusions. The Poles love their vodkas, especially flavored or infused vodkas. Zubrowka (zu-BROV-ka), or bison grass vodka, takes its name from an infusion of bison grass from eastern Poland. Krupnik is an herbal, honey vodka traditionally sipped as medicine or an aperitif. Wisniowa (Vis-ni-O-va) is cherry-flavored vodka, much more widely popular among Poles than American consumers. The list of other flavored vodkas is exhaustive and quite sweet. 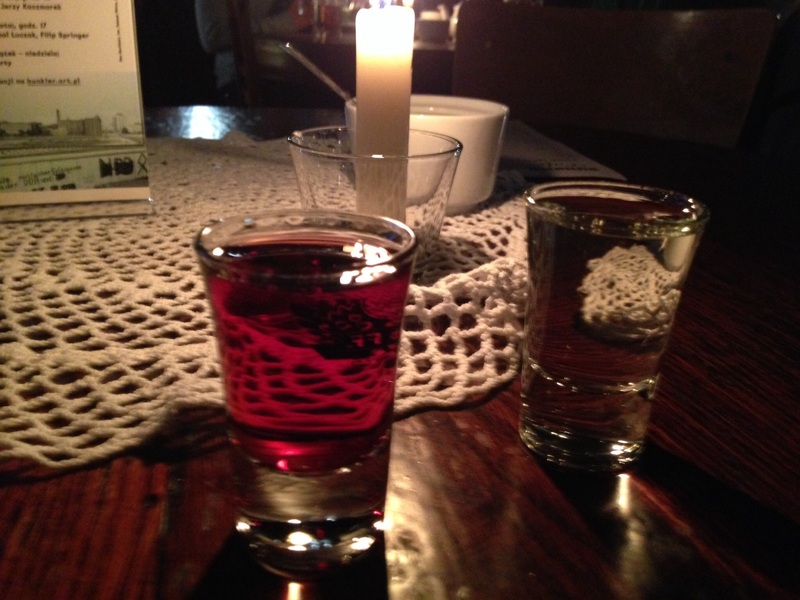 Clearly, one cannot visit Poland without sampling a bit of vodka! Thanks for stopping by! In the next post, I’ll share the experience of a feast of Old Poland at Pod Aniolami, a historic restaurant in Krakow.